It's pretty obvious who is going to win the AFC East division, again. The New England Patriots haven't had any competition inside their division for quite sometime now and that doesn't seem to be changing in the near future. The New York Jets have no plan at QB, the Miami Dolphins just gave Jay Cutler $10 mil and the Buffalo Bills have just two winning seasons since 2000. The Patriots are likely to win all six games, the Jets will probably get swept by the Dolphins and split with the Bills, while Miami and Buffalo each win their home games against each other. Over the last three years, New England is 5-1 against New York, 4-2 against Buffalo and Miami. The Dolphins are 3-3 against the Jets and Bills. Buffalo is 4-2 against New York, with both losses coming last year after sweeping the two previous years. The toughest game New England hosts this year is against the Atlanta Falcons in week 7, a rematch of Super Bowl LI. They will also host the Chiefs in week 1 on Thursday Night to kickoff the NFL season. The Bills have a tough home schedule with games against the Broncos, Buccaneers, Raiders and Saints. Miami also hosts Denver, Oakland and New Orleans. The Jets get the Falcons, Panthers, Chiefs and Chargers at home. I see the Patriots going 6-2 on the road this season with wins at New Orleans, Tampa Bay, Denver and sweeping the division. Tom Brady has tough contests, back-to-back, on the road starting in week 10 (after a week 9 bye) at the Broncos, followed by the Raiders week 11. Then they play the Steelers at Heinz Field in week 15, their fifth road game in six weeks. The only road game I have the Dolphins, Bills or Jets winning is a Dolphins win over the Jets in week 3. 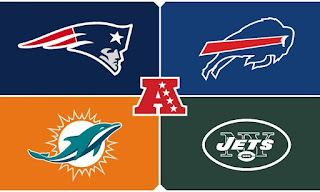 The AFC East has a tough schedule this year playing the AFC West and the NFC South, with some AFC North sprinkled in.